Hollyland is doing some serious work when it comes to its wireless video transmission systems, and the Mars 300 is the latest option for consumers. This is an affordable and portable HDMI set that comes with a transmitter and receiver capable of sending a 1080p60 signal up to 300' away with clear line of sight. Its relative compactness is also hugely appealing to users of lightweight mirrorless and DSLR cameras, as well as those who make use of a gimbal stabilizer and need a monitor off camera. Being HDMI ensures it is compatible with a wide range of current camera models. 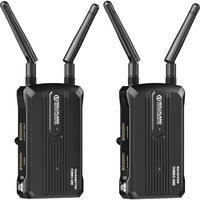 The Mars 300 offers two ports on both the transmitter and receiver. For the transmitter, one is the input while the other serves as a loop output for hooking up a monitor close to the source. The receiver, however, opts for two HDMI outputs for multiple setups if required. This could theoretically mean that the cameraman, director, and producer could all have their own monitors on set, and it would not require any ultra-long wires from the camera to the crew. Operation is simple as it is basically plug-and-play. For power, it can run on a 6-16 VDC power adapter or a Sony L-series battery pack for ultra-portability. There are also multiple screw fittings for mounting on your camera, a hot shoe adapter, monitor arm, or more. Is this a great entry into wireless video transmission? What features are you excited about? Be sure to let us know in the Comments section, below!